Wynonna Earp has the "greatest" fandom in all of television according to Tim Rozon, and he's not afraid to say it. 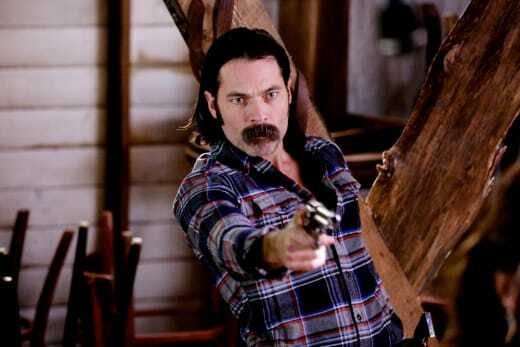 Rozon plays Doc Holliday on Syfy's hit show and said without the fans the show wouldn't exist. He adds that the fans genuinely love the show and that he and the rest of the cast can't help but return the love. Tamara Duarte who plays Holliday's girlfriend/bartender agreed. She said she was worried the fans wouldn't accept her but found she was greeted with open arms. Rozon also briefly talked about Doc's feelings towards the idea of being a daddy. He said that Doc will be involved however Wynonna wants him to be, but there's still the factor of who the daddy really is. It was revealed On Wynonna Earp Season 2 Episode 7 that Wynonna had a one-night stand with a revenant named Jonas who could also be the father of her baby. But we're sure whoever the baby daddy is, Doc will be close by! Check out what else Tim Rozon and Tamara Duarte had to say about the show by clicking below.